For most people there is nothing quite so Italian as a delicious lasagna recipe. Lasagne is a favorite of many of us. 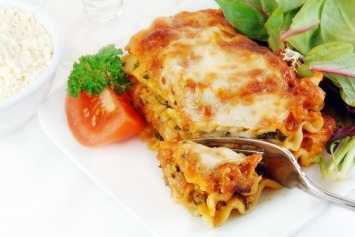 The mix of tasty sauce with meat, vegetables, pasta and cheese hits the perfect note. Heat oil in heavy frying pan or dutch oven. Add garlic and onions and sauté until soft. Add ground beef and continue to sauté until beef begins to lose pink colour. Add mushrooms, celery, and green pepper. Continue cooking until meat is well browned. Stir in tomato paste, tomatoes and seasonings. Simmer for at least 1 hour (or on low all day). When the sauce is ready boil noodles in water until tender. Drain. Rinse with cold water and set aside. To assemble, mix together ricotta cheese, washed and torn spinach, and 1/2 cup parmesan cheese. Pour a very thin layer of meat sauce into a 9x13 inch baking dish. Arrange a layer of cooked noodles over the sauce, top with 1/2 the meat sauce, half the ricotta/spinach mixture and 1/2 the mozzarella. Repeat the layers. Sprinkle remaining parmesan cheese over the top layer. Bake for 35 - 45 minutes. You can also cook the sauce in a slow cooker. Brown the beef and vegetables as instructed above then transfer it all to a slow cooker and cook on low for 8 hours. To determine how many lasagna noodles you may need to cook have a look at your pan first. It is 2 or 3 noodles wide? Multiply that times the number of layers you need and cook a few extra in case one or two of them tear. You won’t be wasting a lot of noodles or trying too hard to figure out how many noodles there are in “6 ounces”. Like many Italian food recipes, this one is fairly easy to prepare, but does take a bit of time. You can make things easier by cooking the sauce the day ahead, then preparing the lasagna the next day. You can even freeze the sauce, then thaw it as needed. Of course you always have the option of buying the sauce. That’s obviously the most convenient if not the tastiest. I often use frozen spinach in this recipe instead of fresh. It works perfectly. And spinach is so healthy for us, it’s a great addition to a recipe like this that is a bit rich. Here is a variation of this lasagna recipe. This one uses veggies as noodles. Have a look at out other mouth-watering Italian recipes too. Boil your noodles and layer it with the meat sauce,plain greek yoghurt, chinese cabbage finely cut, and top it with mozarrella cheese. This gives it a delicious sweet flavour.